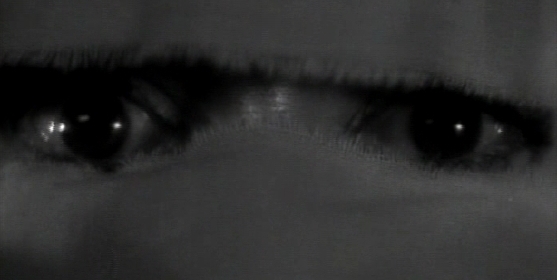 This is my second contribution to the Close-up Blogathon run by Matt Zoller Seitz at The House Next Door. 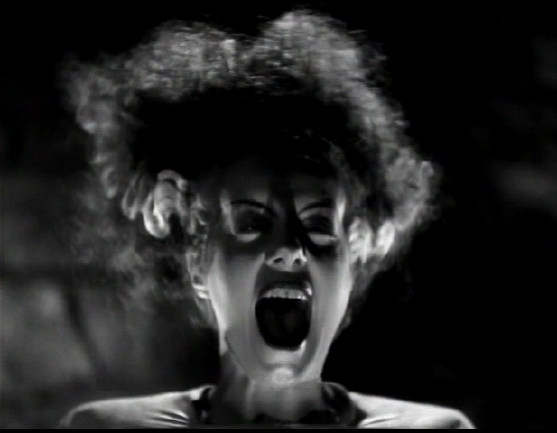 In terms of technique, James Whale’s Frankenstein (1931) is sometimes crude. 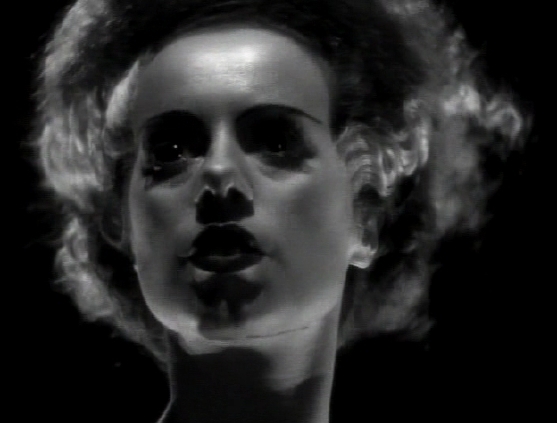 Its canvas night skies droop; a microphone throws a shadow across the scene at the dungeon door where Frankenstein and Waldman prepare to ambush The Monster. Four years later, Whale traded the original’s raw, claustrophobic expressionism for lavish Hollywood Golden Age glamour. 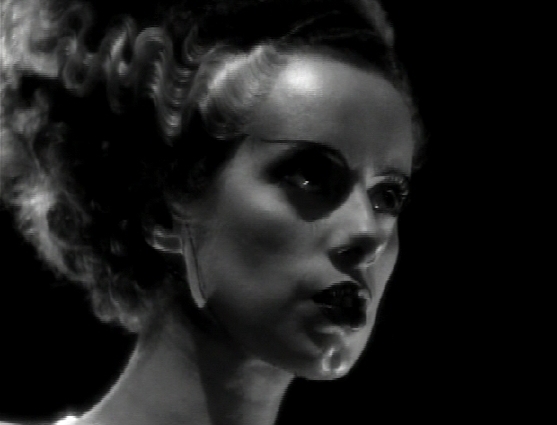 Bride of Frankenstein (1935) is awash is pearly grays and deep focus photography. The sets have grown cavernous and meticulously detailed. Heroic music punctuates every scene. Colin Clive is at his manic-depressive best and he gets to interact with the formidable Ernest Thesiger as the most eccentric, eldritch mad scientist of them all. The Monster has lost his malevolent gauntness. He speaks, cultivates a taste for wine and cigars, sheds tears, and pines for a friend. 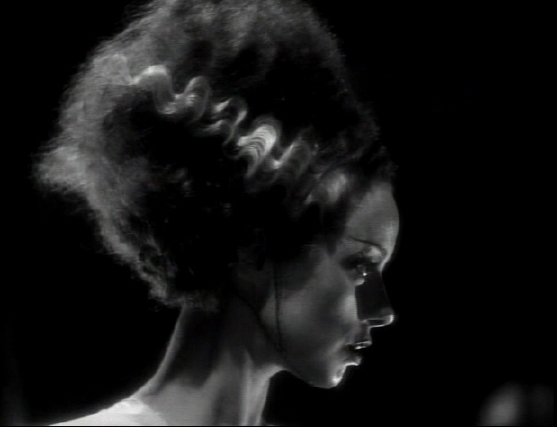 Into this heady mix is introduced The Bride, only to signal a quick, catastrophic end to this macabre fairy tale. The story goes that iconic actresses like Brigitte Helm and Louise Brooks were considered for the role. 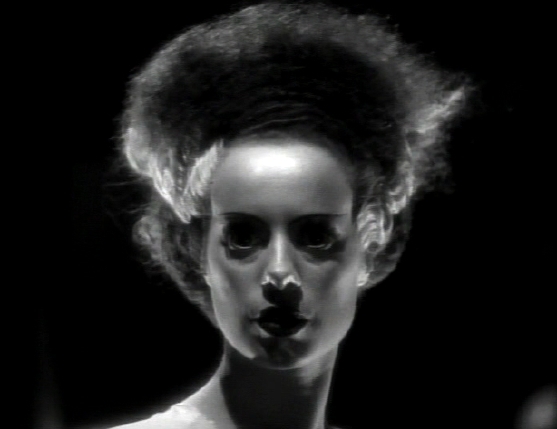 In the end, it fell, magnificently, to Elsa Lanchester, who also played Mary Shelley in the film’s prologue, connecting Mary and The Bride. 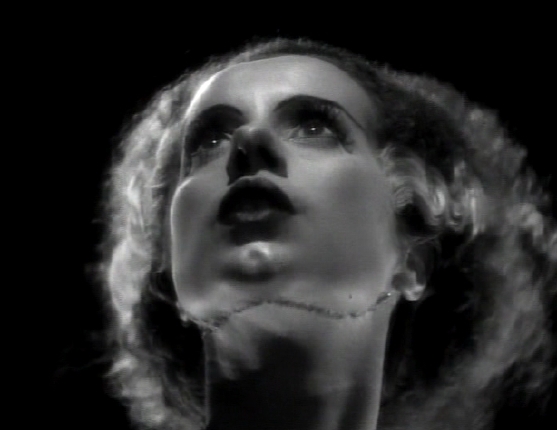 The comparison is made clear and unmistakable: In the opening sequence, a delicate Mary reaches for her beloved Percy, turning her back to the obnoxious Lord Byron, a balletic move directly echoed when the frightened Bride reaches for Henry Frankenstein, turning away from the lugubrious Dr. Pretorius. 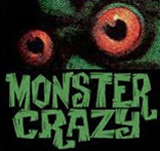 The entire lifespan of the Monster’s betrothed, from the moment we see her fingers move until The Monster pulls the Deus Ex Power Switch that blows everything to atoms, is almost exactly 12 minutes. 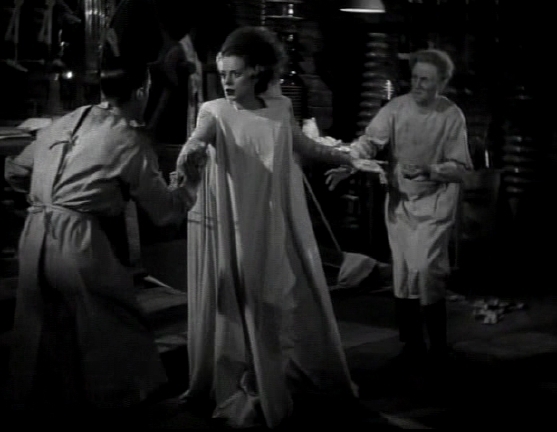 Add a few moments, unshown, while Frankenstein and Pretorius remove the head bandages and slip her into a tent-like shroud. 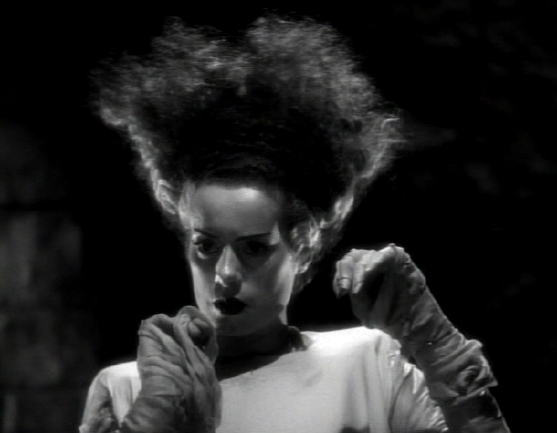 I’d like to think that The Bride’s electrostatic hairdo sprang up on its own as soon as the bandages unraveled. Otherwise, the entire, short existence of the thunderstruck Bride is chronicled on screen, most of it in tight, loving close-up. 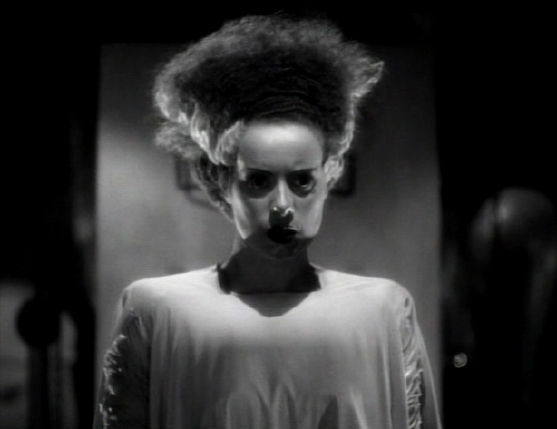 The Bride’s profile was inspired by a bust of Nefertiti, which is appropriate for a Monster Queen. She is unforgettable, with her electrified hair, bee stung lips, lightning bolt scars and big eyes, irises the size of dimes, that never seem to blink. Halloween may be just around the corner, but I’m skipping ahead to Valentine’s Day. Here’s my homage to The Bride, as she appeared in close-up, from the shot of her bandaged head with its crown of safety pins to her final, defiant hiss. 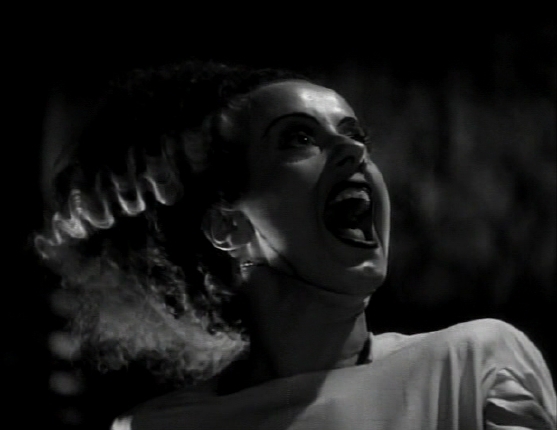 I give you The Beautiful Monster: The Bride of Frankenstein. Directed by James Whale. 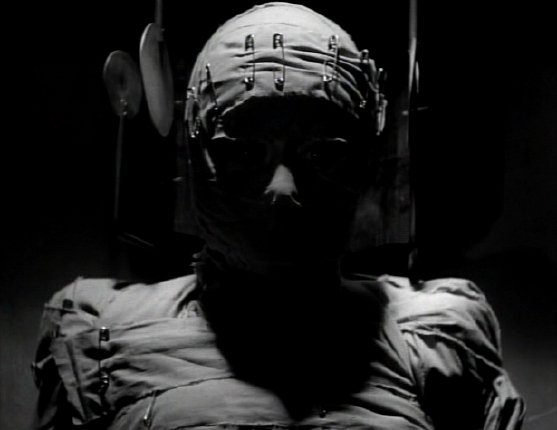 Makeup by Jack Pierce. Cinematography by John Mescall. 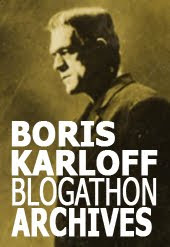 My first contribution to the Close-Up Blogathon, about James Whale’s Frankenstein (1931), is here. i just saw this for the first time because my friend wrote a paper on the gay themes (two men procreating, etc.) in "bride." i had to do a post as well. its such a stunning, complex film. Thanks for this! Else Lanchester is beautiful! Glorious stills from the movie. Of course I grew up watching this, but it wasn't until a film school assignment that revealed BoF's complexity and greatness. I remember pointing out the whole opening sequence's relationship to the Bride's appearance as well. Still the best of the Universals.